Like any newer technology, first iterations are oftentimes expensive. 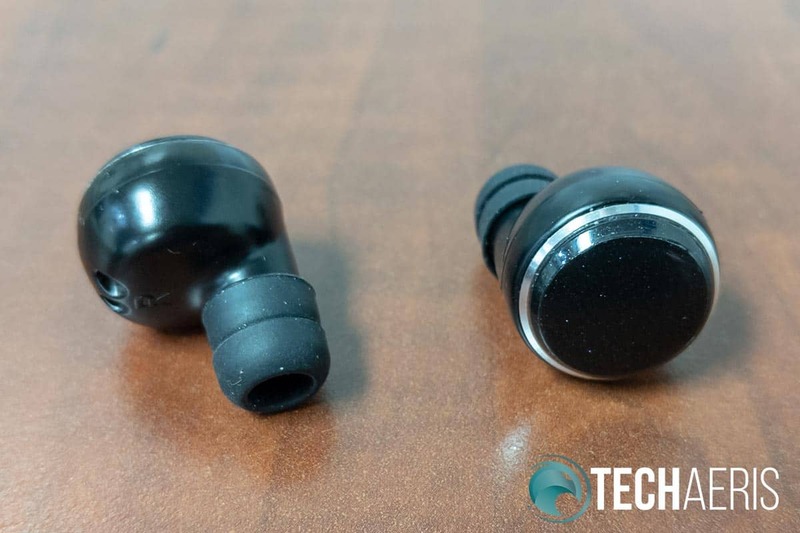 True wireless earbuds have been on the market for some time now and like their wired counterparts, the price has been decreasing while sound quality has been increasing. Still, there are few pairs that are as affordable as their wired counterparts. 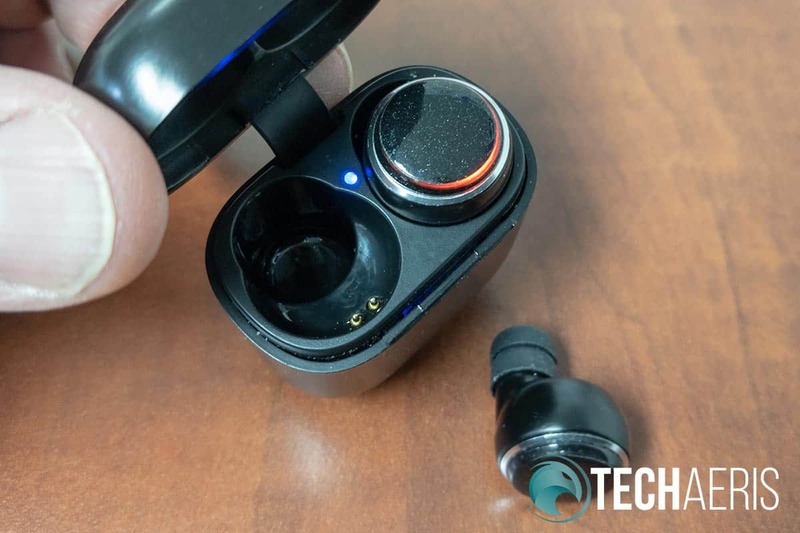 Our Nano Pods review takes a look at a truly affordable pair of true wireless earbuds that are currently funding on Indiegogo. One thing to note, our review sample was a pre-production unit and had a couple issues that we’ve noted but have also been told would be fixed in the retail version. Our scores, however, do reflect our pre-production sample as tested. With that out of the way, read on for our full review! Affordable: A true-wireless earphones for only $19 (Super Early Bird price). Unbeatable Sound Quality: Built by Graphene technology with the balanced stereo. Unbreakable connection: Bluetooth 5.0 offers a 10m range connectivity. Unrivaled Battery life: 5 hours playtime while charging case offer a total of 25 hours playtime. Touch Control: Answer calls/Switch songs/Smart assistance. Ergonomic design: Light and comfortable fit in every ear. Nano Pods as tested. The final version will include three ear tip sets and a user guide. The Nano Pod earbuds themselves are black and consist of a circular main component roughly three-quarters of an inch in diameter. This circle is ringed with a silver ring to give it a splash of colour. The touch surface has a very faint silver sparkle design which is barely noticeable until you look at it closely. Just inside the silver ring along the top half is where the red/blue LED indicators for charging, connecting, or connected are located. 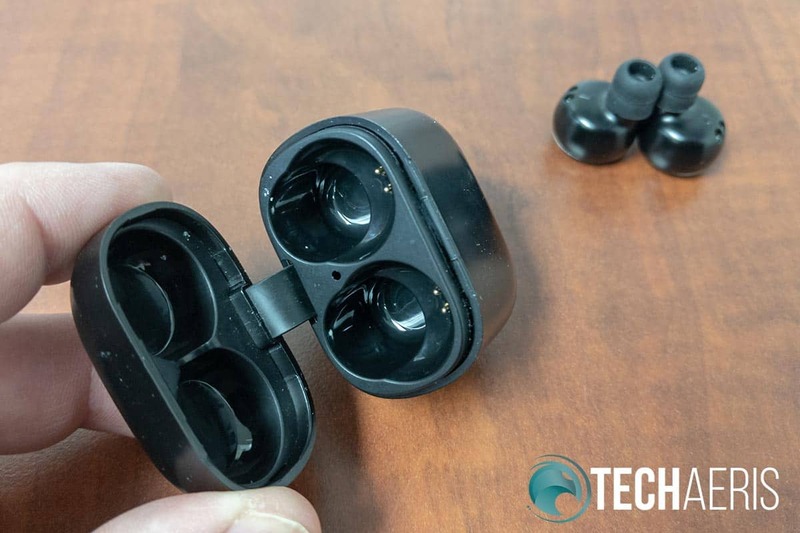 About half-an-inch in thickness, the main part of the earbud has a couple of small tics on the inside which, when inserted into the charging case, connect with the charging pins. Just under these pins are an R or L to indicate which ear the earbud should go in. The ear tip shaft extends about half-an-inch out from the bottom of the main earbud. The ear tips themselves are about a quarter-of-an-inch and actually look like two ear tips doubled up. The case is squarish in shape, with rounded edges and corners all around. Roughly one-and-a-half inches square, it’s about an inch thick, making it small and portable enough to slip into your pocket. The outside of the case is pretty nondescript with only a single Micro-USB port on the bottom for charging. The lid consists of the top half inch of the case and there is a tiny ridge that allows you to slip a nail under to help lift the lid up. The lid is attached to the case by way of a rubber strip that is inserted into a slot in the lid and the back of the case. While flexible, I wasn’t all that confident in its longevity and sure enough, this piece easily became disconnected from the lid and slid down into the back of the case. In the end, it’s a minor defect as the lid attaches to the case magnetically meaning with or without that hinge, the lid will stay on just fine. The underside of the lid is hollowed out in two spots to accommodate the earbuds. The main portion of the case has two holes in which the earbuds fit, tip down. There are two pins that rest on the upper ledge of this hole in which the earbuds rest and, when connected, recharge the earbuds from the case. In between these is a tiny LED light which indicates the charging status of the case. On that note, there is no LED indicator on the outside of the case which would definitely be a nice addition so you don’t have to lift the lid to check on the charging status of the case. 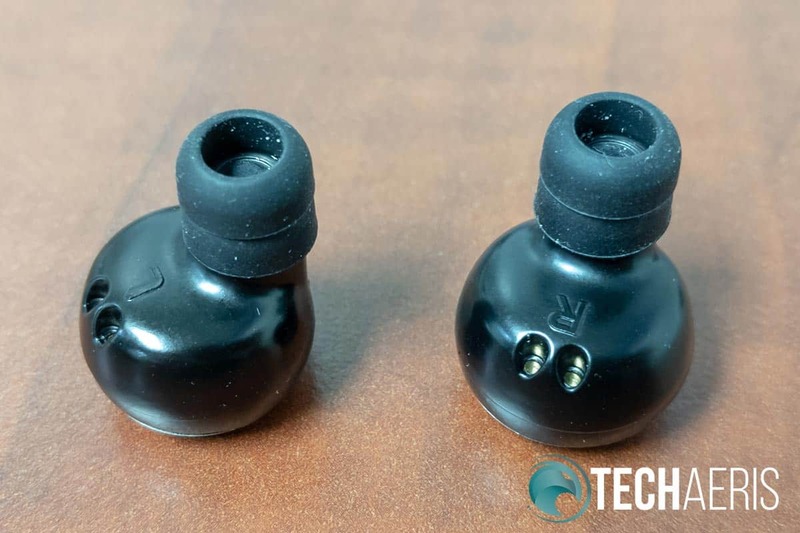 Overall, the earbuds themselves are comfortable and not overly noticeable when worn — much to the chagrin of my wife and boss. Upon first taking the Nano Pods out of the charging/carry case, the LEDs start flashing red and blue. On your smartphone, open your Bluetooth settings and select “unick” to pair. Once paired, the earbuds are good to go. When taking them out of the charging case, they will turn on. If you’re quick enough, you’ll hear a “left channel,” “right channel,” then “second device paired” audio notification through the earbuds to let you know your good to go. Once your music is streaming, you can single tap either earbud to play or pause the music or stop alarms, double tap the right earbud to skip to the next track, or double tap the left earbud to go to the beginning of the current track or skip to the previous track. You can also answer a call by single tapping the earbud while pressing and holding for 2 seconds will reject the call. 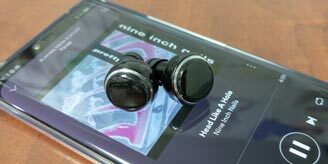 Finally, you can turn each earbud off by pressing and holding for 3 or so seconds. There was one instance when I had no sound out of the left earbud but putting it in the charging case for a couple seconds and removing it caused the earbuds to re-pair with each other. Aside from that, I had no issues with the Nano Pods in performance or ease of use. There used to be a time when quality audio came at a higher price. 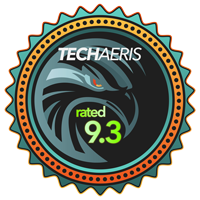 We’re quickly learning here at Techaeris that while that is still true, there are many more affordable options that have as good, if not better, sound than some of their higher priced counterparts. Fortunately, Nano Pods is one such option. At first, I thought they could use a bit more bass but after using them for a couple weeks, the bass levels are a bit of a mix between warm and punchy. While I prefer warmer bass, the mix was nicely balanced and effective in most songs. Overall, the highs, mids, and lows are fairly balanced and it’s easy to get lost in tracks like “Unfinished Symphony” by Massive Attack or “The Sound of Silence” by Disturbed. Everything from classic hip hop to rock and EDM sound really good on these true wireless earbuds. Nano pods can get fairly loud and start to get a tiny bit muddied when at full volume. To be totally honest, though, 80% or so is plenty loud, and I mostly used them set to between 50-60% volume for the most part. One thing to note. While our review sample came with one set of ear tips, the final version will come with three. Ours seemed to fit o.k. but one should always test out the different sizes for the best fit and feel for optimal sound quality. Our quick test call went o.k. with the other party having no complaints about being able to hear me clearly. Of course, as is usual in my case, I can’t help but feel like I’m talking a little louder when using wireless earbuds for calls. Unick claims up to 5 hours of battery life on a single charge and up to 25 hours with the included charging case. During our testing, we were able to get between 4.5 and 4.75 hours consistently when streaming music at about 60% volume. Once dead, the Nano Pods took about an hour-and-a-half to re-charge. Unfortunately, we were only able to get a single full re-charge out of the charging case. Thinking this was an anomaly, we fully re-charged the case (which took about 2 hours) and then tried again. Like the first time, we only got a single full re-charge out of the case before it died. On that note, that means our review sample is only getting about 9 to 10 hours before needing to be plugged in. Of course, we reached out to Unick and were told that they were aware of the issue with some of the pre-production samples and were working on a fix for it. For the time being, our score for battery life reflects the decent single charge battery life on the earbuds coupled with the fact that the charging case didn’t meet up with the specified number of additional charges. That aside, when placed in the charging case, the case light will turn blue (or red if needing to be plugged in) and the earbuds will glow red around the edges. Once charged, the earbuds will stop glowing and you’ll know they are ready to go. With just over a week left in the Indiegogo campaign at the time of this review, the Nano Pods are fully funded to the tune of nearly US$66,000 of their $5,000 flexible goal. While all the $19 Super Early Bird perks are gone, there is still over 600 $24 Nano Pods available, which is just over 50% off the anticipated MSRP of $49. Even at the MSRP, the Nano Pods are a steal given the sound quality alone. Even though this is a fully funded campaign, as with any crowdfunding campaign, there is a risk supporting them. We’ve recently heard about several that we’ve written about that have failed or are having issues. Our reporting on Indiegogo campaigns does not mean we support or are affiliated with them. Support at your own risk. On that note, Nano Pods are expected to ship in May. 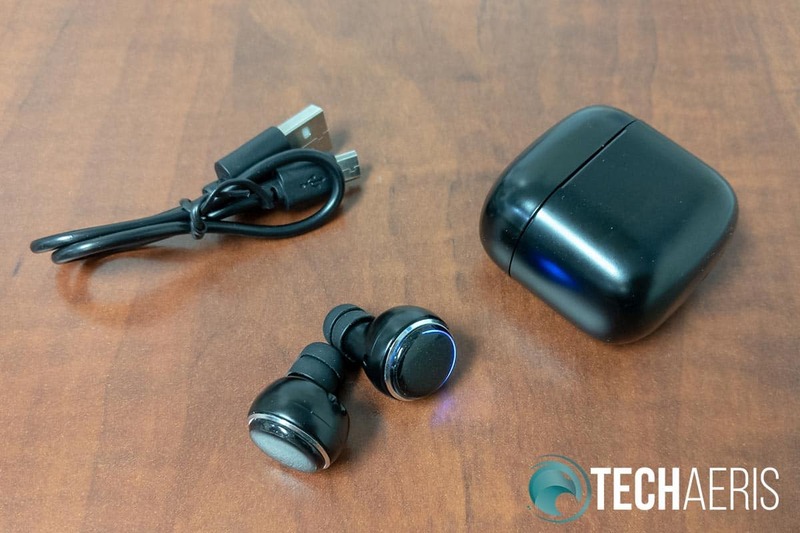 If you’re looking to jump on the true wireless earbud train, the Nano Pods are an excellent choice given the sound quality and current Indiegogo price. Even if you miss out on the Indiegogo campaign, the expected retail price of US$49 is still a steal for these — assuming they’ve fixed the charging case issues. *We were sent a pre-production sample of the Nano Pods true for the purposes of this review.